Christ is Risen. He is Risen Indeed! During the Easter Season, we are called to reflect upon what it means for us to claim that Christ is alive. I would like to share with you what several saints have said about the significance of Christ’s resurrection. “We must consider that it is ours, that it has to do with you and me. We should not only consider how the resurrection happened, but that you recognize that it happens for you, as the Lord says in the words: “Go and tell my brothers!” (Matthew 28:10). There we hear what he intends with his resurrection. As I reflect on what the resurrection means to me, I am reminded of the hope that Christ gives us. In John’s gospel, the first few words Jesus gives his disciples are “Peace be with you.” The risen Christ brings peace and life. In moments of chaos and uncertainty, Christ gives us peace. When fear of death and the unknown come upon us, we know that Christ endured death and returned with the words “Peace be with you”. When we feel surrounded by sin and guilt, Christ gives us words of peace and forgiveness. Remember this the next time we share the peace in worship. The risen Christ is there with us. Be blessed this Easter season. Reflect upon what Christ’s resurrection means for you. On Good Friday the tradition of the Last words or phrases of Christ read aloud is common. These Last words of Christ from the cross have deep impact and inform us about who Jesus was and help us to fully understand what it means to take up our cross and follow. As Jesus is in agony on the cross his thoughts turn to not himself but to God the Father and to our sorry state. This is love. How often does our own pain turn us inward? Often when we are in pain we lash out at others. The reality of life is that most of us don’t know what we are doing. We often fail to truly understand each other or God. And yet Jesus offers love and forgiveness. We often assume that the Kingdom of God is someplace in the distance after we die. However, When Jesus talks of the Kingdom it is always in the present tense. What might the world look like if we lived like the Kingdom of God was here and now? That is the Jesus. For the thief on the cross, he simply had to ask and Jesus graciously granted it to him. Are we bold enough to ask for ourselves? 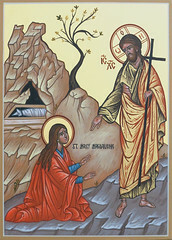 When Jesus saw his mother and the disciple whom he loved standing beside her, he said to his mother, “Woman, here is your son.” Then he said to the disciple, “Here is your mother.” And from that hour the disciple took her into his own home. And Jesus on the cross shows concerns for others rather than himself. He offers his brother and disciple and new mother. And his mother a new son. We are adopted into the family of Christ at baptism and we are not left alone. In the great cloud of witnesses, we are given new brothers, sisters, fathers and mothers. This communion of saints walks with us on our journey of faith in Christ. Yes, even Christ felt forsaken. There are times when we feel God has abandoned us. There are times we feel abandoned by those around us. It is painful. Yet we know that God is the source of our salvation. We know that Joy will come in the morning because although Jesus is on the cross here, there is resurrection yet to come. Lament, Wail, Cry, Curse, you need not deny your pain. Yet remain in hope. After this, when Jesus knew that all was now finished, he said (in order to fulfill the scripture), “I thirst.” A jar full of sour wine was standing there. So they put a sponge full of the wine on a branch of hyssop and held it to his mouth. We all thirst. Thirst comes in many forms. We thirst for physical things like water. We thirst for things like peace, justice. We often have a hard time finding a place to satisfy our thirst. We know that Jesus offers us living water when he encounters the Samaritan woman at the well. An Orthodox priest was once asked, “If God is everywhere, Why is the Church necessary?” And he replied “Yes, God is everyone but so is water. Water is in the air we breathe but, we still must go to a well or stream. The church is that well.” What wells do we go to for water? We are reminded every Sunday through the means of Grace (Baptism and Eucharist) that God promises to be present. Let us not forget to come together and receive the water that quenches thirst and the bread that satisfied hunger: Jesus Christ. Jesus breathed his last and trusted the Father. What does trusting God look like to you? Would you be willing to die in that trust? These last words of Christ remind us that we all need to die. We need to let go of our ego, our pride, our own way of doing things. When we let go and trust. New life can begin. What needs to die in you so something new can begin?